The Inge Morath Foundation (former non-profit) was established in 2003 to facilitate the study and appreciation of Inge Morath’s contribution to photography. 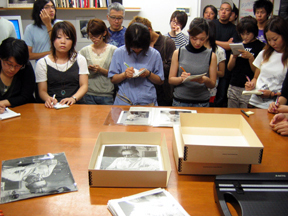 The Foundation served as a public resource for the international community of scholars and curators, as well as general audiences interested in Morath’s work, and supported work in three program areas: Grants and Awards; Educational Programs; and Traveling Exhibitions. The research space closed down in 2014, and all ongoing activities of the Inge Morath Estate were folded into the Legacy Program of the Magnum Foundation, New York. The Inge Morath archive was acquired by the Beinecke Library at Yale University, and a set of Morath’s master-prints by the Yale University Art Gallery, where they are now open and available to scholars. All works owned by the Estate are available for inclusion in museum exhibitions, contingent on print availability. The Estate also holds the copyright to Inge Morath’s photographs and writings. Comprised of thousands of items from all periods of Morath’s life, the archive includes Morath’s collection of her own works, her contact sheets, caption books, and writings related to her work. The Estate uses this resource for its own work as well as to encourage and support students, scholars, and curators in their research. Morath’s negatives, and a set of her contact sheets and caption books, remain actively in use at Magnum Photos, New York. Research: For ongoing research, please visit or schedule an appointment at the Beinecke Library. A guide to the Morath photographs and papers is available here.